Paintball for girls? Yes, it’s for us too! Contrary to popular belief, paintball isn’t just for the chaps – paintball for girls is just as popular! Many of our female customers enjoy paintball events at Delta Force and we even offer mini paintball events that are a softer-impact game and suitable for anyone over the age of 8 years. Our mini paintball guns are smaller, light-weight and use smaller paintballs so there is less energy when the ball hits participants. These unique events are currently only available at a selection of Delta Force Paintball centres in the UK including: Surrey, Kent, East London, North West London, Southampton, Birmingham, Coventry, Leeds and Cardiff. Eventually, all Delta Force UK paintball centres will offer the option of mini paintball events to all our customers. 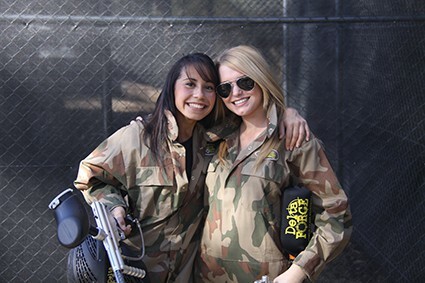 Hen paintball parties are also another popular choice for female paintball enthusiasts. 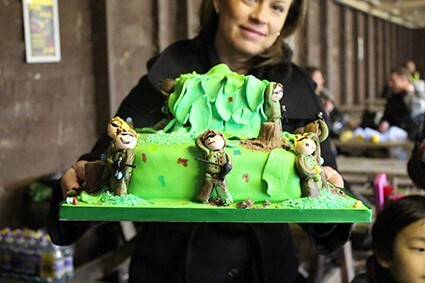 Celebrating their last days of freedom with a group of their closest friends –dashing about in the woods in fancy dress and shooting at one another – it’ll definitely be a memorable experience! Tailored games can also be arranged so that the bride-to-be becomes the main focus of the game- who will you nominate out of your friends to act as her bodyguards? It’s up to you to assign the roles! Many thrill seeking birthday girls also opt for a game of paintball at Delta Force to celebrate their special day in style. Suitable for both adults and children (over the age of 8) our paintball parties offer customers a first class service, top facilities including proper flushing toilets and open and closed picnic areas with plenty of seating and a selection of thrilling game scenarios to enjoy. Our experienced team at Delta Force Paintball will ensure everything is well planned out so that your birthday party goes without a hitch. Adult birthday girls can even take advantage of our paintball pyrotechnics including paint grenades, smoke grenades and MK5 Thunderflashes! These can be great for gaining the advantage against your opponents during battle! For more information please visit the Adults prices page. For more information about Delta Force mini paintball events or to book a special hen or birthday paintball party with us, call 0203 869 9301and speak to one of our friendly advisors.